Tofino has quickly become the west coast center for bodywork, spa and yoga activities. Choose from one of the many wellness studios that endeavor to create an serene atmosphere and a menu of body treatments that will leave you feeling radiant and renewed. Revolutionize the way your skin feels and receive a holistic-based aesthetic treatment such as facials, exfoliations, wraps, pedicures, manicures or waxing. Reduce pain and dissolve stress by receiving a therapeutic body treatment such as acupuncture, massage therapy, hydrotherapy, energy work or aromatherapy. Often treatments are inspired by the scents of the rainforest or the elements of the ocean. What a great opportunity to take the time to treat yourself to something out of the ordinary. The benefits of many treatments are significant and well documented. For those looking to maintain their yoga practice while away from home, drop into one of the ongoing yoga classes in Tofino. For the curious there are Yoga instructors that give classes both in a private and group enviroment. Tofino has a lifetime of health and wellness options to explore. Re-inspire your spirit, soothe your mind, meditate on your life or simply absorb this magnificent area. Tofino has become the west coast center for bodywork, spa & Tofino yoga. 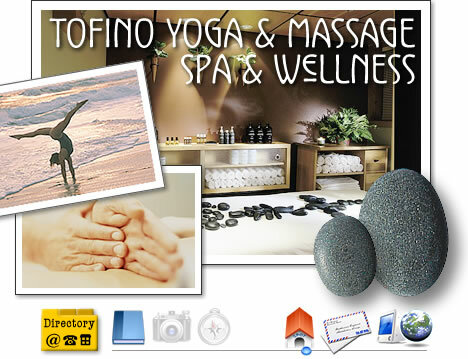 Tofino massage & wellness studios offer Tofino spa experiences.